PALMYRA, Mo. — Joyce Wagner knew about good, unique crafts -- she'd been buying them for years. But the Palmyra resident never really made any of her own until last year when she spotted wooden roses at a fair in Fulton. "People were walking by, and I thought 'Why aren't those wilting?' " Wagner said. She tracked down the booth selling the long-stemmed roses and discovered that they were wooden, made from birch shavings. Wagner bought eight dozen and gave them away, then decided to track down the supplier herself. Once she found the maker in Colorado, she ordered 3,200 the first time. She has placed similar orders three more times since June. 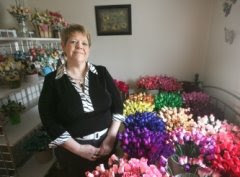 Wagner's venture with the roses, along with her other business of selling streak-free cleaning cloths, has proven so successful she's quit her full-time work. Every weekend, she heads somewhere for an event where she sells the roses.